I may have mentioned it before, but I was such a big fan of Irma Bombeck, the satirical columnist/housewife. Bombeck was an American humorist who achieved great popularity for her newspaper column that described suburban home life from the mid-1960s until the late 1990s. Her humorous takes on what was so much of my real life during that time and kept me going with my chin up when my derrière was dragging. 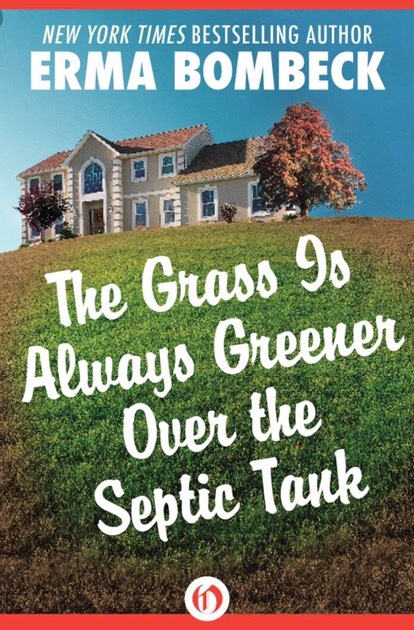 One of the things that she said years ago that really resonated with me is “The grass grows greener over the septic tank.” I’ve never forgotten that. Every time I have been through a terrible circumstance in my life, I always try to remember her insight. Trying oh so hard to believe that I am learning from whatever I am plowing through and that I will be growing more in so many ways because I mucked through that particular experience. Those thoughts bring me to this. Listening to the news lately, looking around me concerned about what’s happening in the world I’m getting kind of scared about the future of our country. What’s happening with my grandchildren’s generation? I’m wondering how many of these young kids really have the guts and the fortitude to take their knocks and get up again from life’s hits. I have this terrible feeling that my children’s generation have coddled these kids so much that they won’t be able to survive unless they are hidden in a safe room and someone is patting the top of their heads telling them that everything is okay and they are so special that they deserve life’s rewards without doing the hard work to achieve it. I hate to sound like a petty old grandma, but the reality is, neither I nor you, I’m sure, ever got much unless we worked for it and do you know what the result of that was? We really were so proud of what we achieved. We felt we had done something on our own. We really appreciated the benefits of personal achievement. No one gave us a trophy if we didn’t deserve it. The hope for all of us is that there are parents out there who get it. Parents who really make their children work to achieve to be independent thinkers in their lives. They will be the movers and shakers not afraid to take risks. They will be the ones who are sending their parents on a cruise because they love them and they’re also going to pick up the tab. Growing up I know the fire I always have felt when told it couldn’t be done. As an adult I know when I was drowning I took my sinking high heels out of the glop, changed into my running shoes and told myself tomorrow was another day. How did us old folk get so smart? We earned it by trial and error. Taking risks – sometimes winning and sometimes losing and not hiding under the covers through the storms. We didn’t have ‘Thunder Shirts’ that made us think everything was peachy during difficult times. We wiped off the dirt and moved forward. Genxers, for heavens sake, man up and have your Millennials get out there and mow the darn grass over the septic tank before it swallows them up.